Send us an inquiry to get specific pricing for Dolphin Daze. We spent a wonderful week on the Dolphin Daze. The crew, Lesli and Ryan, were amazing, so fun to be with and so attentive to our needs and every request. The food was perfect, just the types of things we had requested prior to the trip. The boat was so comfortable and we made use of the paddle boards, snorkels, fins and other toys that were available. Lesli led us on two interesting walks on land, and Ryan captained the boat expertly. It was such a relaxing week, just what we were looking for, and made even more special because of Lesli and Ryan’s ready smiles and cheerful dispositions. Just a magical experience and one that left us all with fond memories. WOW!!! 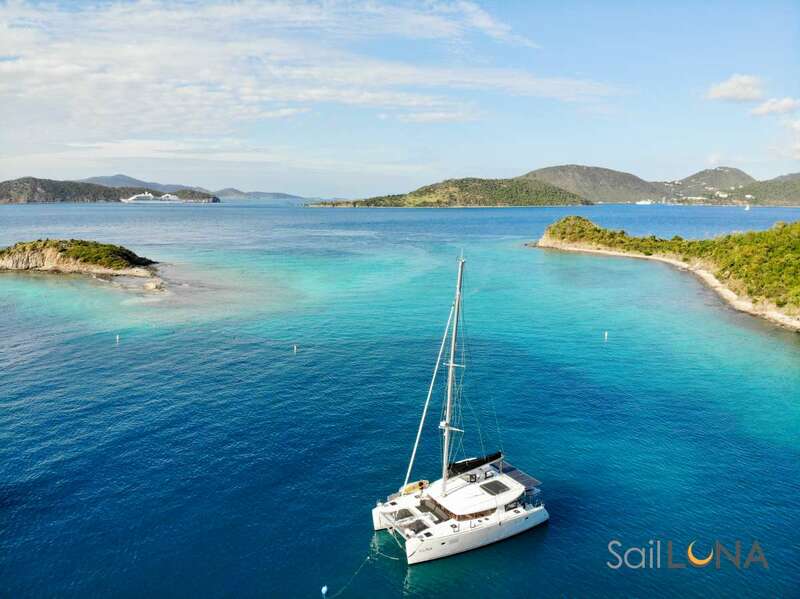 What an AH-mazing 9 days we had with y´all sailing the BVIs on Dolphin Daze! Your ability to anticipate our every need is truly a gift. The boat was immaculate and the food was delicious! Our favorites were the seared tuna, key lime pie and the orange vanilla crème brulees! Ending our nights with Tim playing his guitar and singing (that voice!!!) was so very special! Every niche you took us to was perfect! From snorkeling spots, to kayaking, to paddle boarding and the incredibly beautiful beaches, oh the beaches! Our most favorite spot was Anegada, truly heaven on earth! We cannot thank you enough for taking such good care of our group and helping us celebrate Marty´s 50th Birthday, it is something none of us will ever forget! We don´t think the trip could have been any more perfect, so THANK Y´ALL from the bottom of our hearts for the memories of a lifetime! Goodness; what a gift to have spent seven days with two of the most incredible and adorable people we have met in a very long time. As with any trip of this magnitude, we were a bit apprehensive, but immediately put at ease upon meeting you. From the warm smiles, professional knowledge and genuine care, you two were over the top! Ryan, you’re the consummate captain and host, and Lesli, you’re the epitome of grace and great cooking. It’s obvious you both love what you do, as well as deeply love each other – an incredible winning combination. Please know that we are both looking forward to working with you again soon. Thank you for sharing your talents and beautiful spirits with us. We can’t imagine better cruise partners! Please stay in touch and above all, be safe. Went on a sail with Ryan and Lesli and had a great day. The sailing was great, the snorkel stops guided by Lesli were excellent, lunch was perfect, and the conversation was enjoyable. Ryan and Lesli are a very efficient but relaxed couple and they work hard to be accommodating. I would recommend Ryan ann Lesli to anyone who wants to experience a great sail around the Islands. Being in the Virgin Islands was absolutely magical and I didn’t think it could get better until I sailed with Ryan and Lesli! The boat is beautiful and the hosts were amazing. They customized the trip to our group and spent more time than they had to. They both patiently answered my endless questions about sailing and the islands. Towards the end of the trip, I got seasick. I was quite embarrassed but they comforted me, brought me cold towels to help me with the sickness and taught me a few tricks to get over it. They took such good care of me and were so understanding. They were attentive, friendly, informative and fun. I am an avid traveler and have been around the world, however, this is my favorite trip thanks to Ryan and Lesli! I can’t thank you both for unforgettable memories and making this trip epic. I absolutely can’t wait to come back to the islands and sail with you again. You two are so genuine and great! Keep up the fantastic work and make more people the happiest! Captain Ryan and Lesli were phenomenal hosts! They shared fun facts about all of the islands we sailed by and ensured we had delicious drinks and local food. I was a little timid the first time we went snorkeling off the boat, but Captain Ryan was very competent and I had the utmost trust in him. We were able to see and do so much with Captain Ryan. We snorkeled at Lovango and Henley Cay, we sailed to St. Thomas and snorkeled with turtles. We even ordered pizza from a boat! For my birthday, Captain Ryan customized a special trip out to Waterlemon Cay for us. My husband and I enjoyed a sunset with a view to die for. On our snorkeling adventures we saw sting rays, turtles, barracuda, eels, starfish, reef shark and a number of exotic marine life. Captain Ryan and Lesli made our vacation! Ever since my husband and I have returned home we haven’t stopped talking about sailing and how we cannot wait to go back! Coffee, Tea and Fresh Local Fruit served with every breakfast. Eggs Benedict: Perfectly poached eggs with Canadian bacon atop toasted English muffins drizzled with homemade hollandaise sauce. Served with roasted, seasoned potatoes and fresh avocado. Cinnamon & Vanilla Challah French Toast, served with homemade syrup and crispy bacon. Huevos Rancheros: Eggs cooked to order atop seasoned black beans, homemade pico de gallo and oven toasted corn tortillas; garnished with Mexican cheese, fresh avocado, cilantro and an array of salsas. Frittata: Oven baked eggs with cheese, fresh cut vegetables and meats of your choosing. Served with seasoned sausage patties. Bagel & Lox: Smoked salmon atop a toasted bagel with cream cheese, red onions, capers and chopped dill, fresh from the boat’s garden. Served with a sliced boiled egg. Pancakes made from scratch with homemade mixed berry syrup, garnished with confectioner’s sugar. Served with perfectly browned sausage links. Assortment of muffins, croissants, granolas and yogurts. Fish Tacos: Fresh Mahi Mahi, seasoned to perfection with local slaw and lime aioli served with corn or flour tortillas and a side of fresh local greens, roasted beets and homemade vinaigrette. Maine Style Crab Cakes served with dill aioli, sliced chives and homemade roasted corn salad. Local Chicken Roti with mango chutney, rolled in authentic Roti wraps, served with local plantain chips. Cheeseburgers in Paradise: Seasoned with secret ingredients and grilled to order. These cheeseburgers come with all the fixings. Served with crunchy dill pickles and potato crisps. Flank Steak Salad, grilled to order, atop local mixed greens, cherry tomatoes, avocado, red onions, gorgonzola cheese and homemade Dijon Balsamic Vinaigrette dressing. Served with toasted garlic bread. Lemon Basil Shrimp Pasta: Light, lemony pasta dish served with parmesan crisps. Greek-Style Chicken Gyros: Marinated chicken with homemade tzatziki sauce, tomatoes, cucumber, red onion and feta cheese wrapped in traditional Greek Pita Bread. Served with fresh cut veggies and creamy homemade hummus. Bacon wrapped Scallops, with Cajun cream sauce. Coconut Shrimp, oven baked and served with a sweet Thai chili sauce. Creamy Spinach and Artichoke Dip, served with warm pita bread. Stuffed Mushrooms: Spiced sausage, fresh rosemary and mixed cheeses served in buttery oven baked mushroom caps. Shrimp Ceviche, a traditional local recipe served with blue corn tortilla chips. Charcuterie and Cheese Board: an assortment of meats, cheeses, mustards, pickles and olives. Caprese Skewers: Grape tomatoes, fresh buffalo mozzarella, basil from the boat’s garden, with a touch of olive oil and a sweet balsamic glaze served on a skewer. Bacon-Wrapped Filet with Truffle Butter, grilled to your perfection, served with garlic mashed potatoes and grilled zucchini squash. Pan Seared Tuna Filet with Homemade Chimichurri Sauce, served over cilantro rice with sautéed sugar snap peas. Prosciutto and Herbed Cheese Stuffed Chicken with Tarragon White Wine Sauce, served with mushroom risotto and glazed carrots. Fresh Caught Mahi Mahi with Local Fruit Relish, served over sautéed spinach and pine nuts with garlic & herb cous cous. Grilled Salmon with a Ginger Soy Drizzle, served with rice pilaf, asparagus and cherry tomatoes. Chicken Piccata, topped with parmesan, pan fried and finished with a buttery, lemon garlic and white wine sauce with capers. Served with creamy polenta and a roasted vegetable medley. Pork Roulade, stuffed with apple and sausage, sliced into artistic medallions and served with roasted red potatoes and Lesli’s special pan fried brussel sprouts. Key Lime Pie: Tart, rich, creamy with a salted graham cracker crust. Vanilla Crème Brulee Rich custard with caramelized sugar. Berry Bliss Cheesecake, with homemade buttery graham cracker crust. Ultimate Fudgy Brownie Sundae, with Vanilla Bean ice cream and all the best toppings.